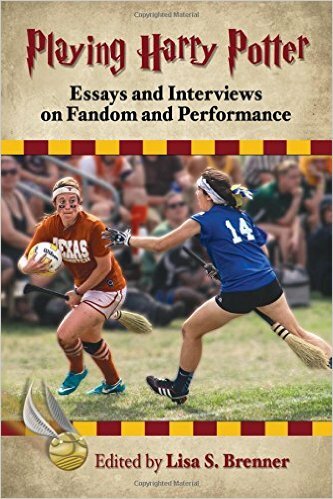 In one way or another, I have been studying fandom now for just about nine years. You’d think I’d be an expert by now (or at least have a Master’s degree! ), but instead I’ll just say that I have a very good grasp on the complications of fandom. Not an “expert”, not even very knowledgable. I just know about how much I don’t know. Progress? I’m not sure. Every once in a while, something new comes down the old Twitter timeline to grease the wheels. This time, it was something a friend who had recently gone to see New Kids on the Block in concert. 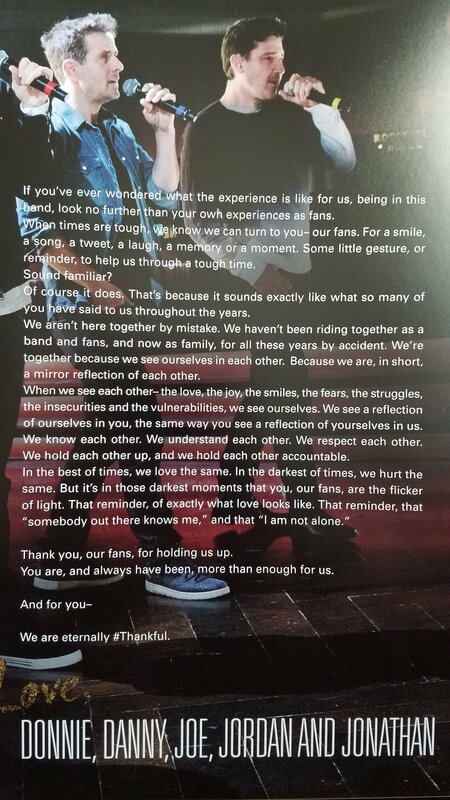 I believe it was an excerpt from their tour program (forgive me if that’s incorrect), and it’s certainly worthy of sharing here. When I read the statement, I have to admit, I wished that I had been a New Kids fan. I was never into their music, but I have friends who still go to see them. They speak of meet and greets, and fan events like cruises, and even tweeting back and forth with them on Twitter. There seems to be very little barrier (if any), between fan and band, which to me is both incredibly unusual…and honestly…a little other-worldly, given my own experiences as a Duran Duran fan. It’s completely different from what I know. Maybe some of you would argue otherwise. Perhaps those who really know the band would say they’re just as tuned-in. Maybe not. Maybe Duran Duran is more reserved. Personally, I still revel in the moments when Simon comes to center stage just before they perform during the encore, because he usually speaks from the heart. Sometimes it’s about the fans. I appreciate that moment because it’s heartfelt. I almost always leave a show feeling bittersweet and thankful I’m fan. There are so many potential discussions to be had here, it’s difficult to know where to begin. I can also see how easily this can slip into “why can’t Duran Duran be this way” territory, which it did the other night when I had some chats about it on Twitter. There were tweets about the relative absence of Duran Duran members on social media (aside from the DDHQ posts). Some mentioned that sometimes the band just seems very inaccessible, cold, and distant. I had one person even say that sometimes they look down from the stage at the fans as though we’re trying to climb into their lifeboat just a like a scene from the movie Titanic. Still others think the band is slowly trying to disengage because they are coming closer to their own retirement. Whether or not any of that is true, I think as fans we tend to expect a lot more than any human can deliver. Also, despite speaking the same basic language, the differences between our cultures and the types of boundaries we maintain are vast. I can cite hundreds, if not thousands of tweets I’ve seen with my own eyes from fans that are miles over the line of what is socially acceptable. While yes, it’s all in good fun when we send them, we don’t know how they’re being taken on the other side. I must count myself in that insanity. I’ve done dumb things over the years just like anyone else. Lastly, the band skyrocketed to fame hard and fast at a very young age. I can’t help but believe that didn’t have some effect. Comparing Duran Duran to the New Kids on the Block is like comparing an apple and an orange. They’re both fruit – juicy and yummy – but in completely different ways. It is unfair to hold one up to the same standards as the other, so we (I) must resist the urge. So, let’s focus on the obvious – how cool was that statement?? I think what strikes me most is how well they recognize exactly what fans feel. Not only do they acknowledge how they feel as a band, they seem to realize that fans feel the same way. They share that connection, and one feeds the other. I’ve often wondered if bands out there really get it. NKOTB certainly does. The last few lines really tug my heartstrings. “That reminder, that ‘somebody out there knows me’ and that ‘I am not alone. '” (Anybody know, are those lyrics?) That’s how I feel at a show, which is crazy because Duran Duran doesn’t know me, but sometimes it feels like they do. The one thing I’d say to Duran Duran, if possible, is that whenever I’m on social media and get into this kind of discussion with fans, invariably someone will interject and say that the interpersonal connection doesn’t matter. It’s only about the music. I can count on someone tweeting me to say that every single time. In some ways, it feels a little like a dismissive statement, in other ways, it feels like they’re trying to tell me that since I’m not “all about the music”, I’m less-than. While I cannot deny that for some fans, it may really be all about the music… maybe they go to concerts, buy albums and go home. I don’t hear from them about my blogs, or see them online very often, if at all. I’m here to tell you that for the vast majority of Duran Duran fans that I have ever run into, it is NOT JUST ABOUT THE MUSIC. Music plays a huge part, but there’s a little something more there than just liking some songs or a few albums over the years. I like a lot of different bands. I sing along to many different songs on the radio, and buy hundreds of albums. I love music in general. But there are remarkably few bands that I spend real time on. I mean REAL time. Forget the money, I’m talking time that could (and probably should in my case) be spent elsewhere. My friends come from this community. My travels are at least in part due to this band. I wouldn’t spend that time if I didn’t like, if not adore, the people I was supporting. I’d just sing along on the radio or buy an album and be done with it. That isn’t what is going on for me (and thousands of others) with Duran Duran. You don’t spend thirty or forty years on a band if you don’t feel some sort of connection with them. You just don’t. Sure, you can pay someone to do all that work for you. The tweeting, the fan gatherings, the contests. Every band does that, and by all means it is a vital and necessary part of PR that no one has the time or passion to do on their own. I will just say that the few times John even goes to the trouble of sending a video that gets posted, or when Nick takes a picture pointing out Late Bar on a sign…or when Simon takes a picture from his hotel room just to share what he’s seeing, those moments are golden. Why? Because it’s an acknowledgment that we exist. That they know we’re out here, still paying attention, still supporting, still being fans…and maybe, just maybe, we actually matter to them even a fraction as much as they matter to us. It’s about the connection. Despite what some try to tell me, I know enough to realize that yes, it really does matter. I applaud the members of New Kids on the Block for not only getting the message, but embracing it. By far, this is the most lovely thing I’ve ever read from a band to its fans.